Invite Mexico into your Home. 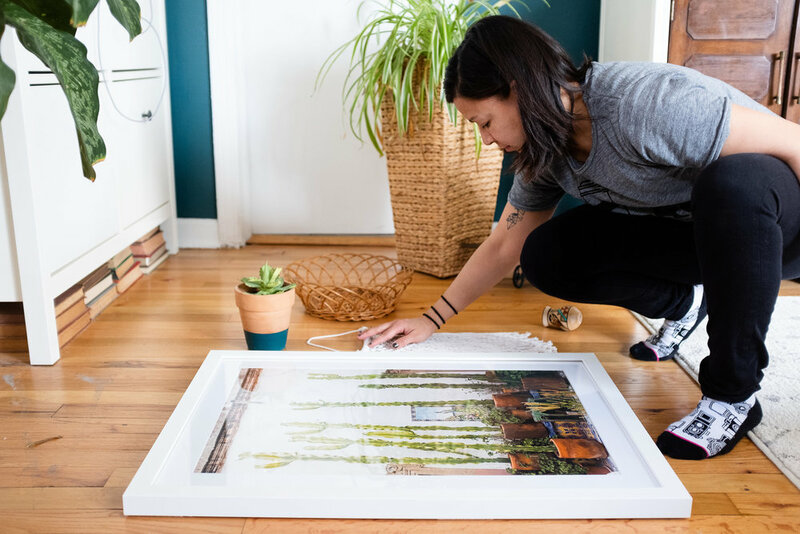 These mini prints are the perfect addition to a gallery wall, a shelf, or even a workspace. The photos are taken in different places in Mexico so you can feel and even envision what Mexico is like through these little pictures of everyday life there. The newly released San Miguel Collection is the beginning of many more Mexican cities that will be represented through images. After visiting San Miguel de Allende in 2017 for a workshop, Karina went back to capture more of the city that inspired her to start this endeavor. In the future Karina will be planning to travel to different Mexican cities to try to capture more of the Mexican culture while educating others of Mexico's history and how that has inspired so many of the foods, decor, and customs they've grown to adapt and love. She will be launching a new collection of products at the end of the 2018 summer, so stay in the loop by signing up for weekly e-mails. Until then, enjoy the new collection of pictures from San Miguel de Allende. I've been a photographer for 10 years, but I'm most passionate about being able to display photographs of Mexico in my home to connect my family and others to my culture. I travel to cities in Mexico to take pictures, then prepare them, ready to hang, so you can always have a piece of Mexico in your home. I'm passionate about educating others about Mexico through art. Mexican culture is more than just Cinco de Mayo celebrations, margaritas, and piñatas. While we all love a good margarita, I want to share the beauty, vibrancy, and humanity that is Mexico. Homeschooling my children isn't want I expected for my life, but having been doing it for 4 years now I can't imagine anything else. I still have a lot of preconceived notions to work through as a type-A, public school raised mom, now homeschooling my kids, but I want this to be a platform to be honest about our journey and encourage others who are on the same path. RAICES is on the ground in Texas, working to raise funds to provide legal services for detained parents and to help pay their immigration bond, and reunite families faster. For each purchase made from either San Miguel Collection I'm donating 15% of sales. I've also launched a downloadable collection with phone wallpapers and prints, you can download to your computer. 100% of all downloadable sales will be donated to RAICES. The ACLU put together a petition for Homeland Security to end the separation of children from their families. So even if you can't donate or purchase, think about signing. I'm just a mom of two trying to navigate raising bi-racial kids in this society. As I dive deep into learning about the Mexican culture to teach my kids, I like to share my rich culture with others. While I'm not a great cook or anything close to that (Michael actually cooks most of the meals we eat), I do like to share about quick and simple recipes that I've grown up with. I also partner with interior designers to give you inspiration for how to style your room around the prints from Mexico. Summer is a great time to invite friends over, share great conversations and good food. I've put together a mini summer cookbook to give you some easy options for a quick dinner, or for the weekend get-togethers.